This past weekend, we celebrated my son’s 4th birthday with a Star Wars Party. I have never had so much fun planning a party as I had with this one. 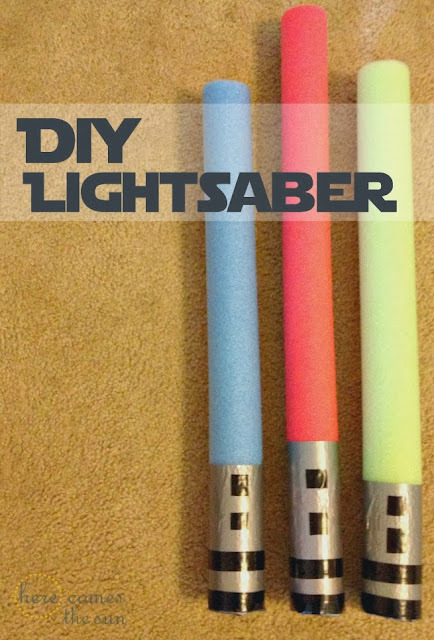 There will be a post coming soon with all the fun details but today I want to share how to make a Star Wars staple… a DIY Lightsaber. Lightsabers are essential in every Star Wars Party. There are many party games that you can play with these. If you are not a Star Wars fan and have no idea what I’m talking about, don’t worry… you will be a fan when you read about how fun this party was. Now… To make the Lightsaber. It is made from a pool noodle, duct tape, and electrical tape. I bought the pool noodles on clearance at the end of the summer. I think you could probably order some online if they are not in the stores at the time of your party. You will want red, green and possibly blue. Red is for the bad guys and green and blue are for the good guys. Cut each pool noodle in half with a serrated bread knife. 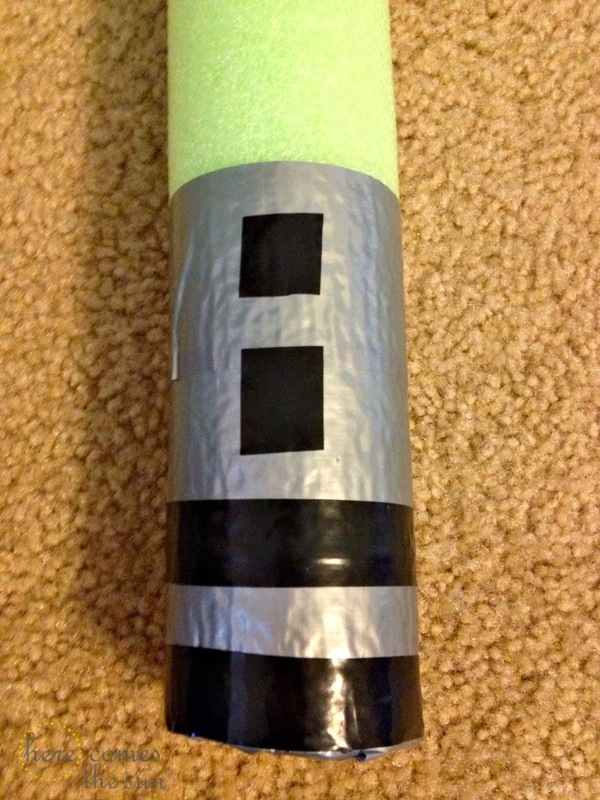 Wrap duct tape around approximately 4-5 inches of one end of each noodle. Wrap the electrical tape around the bottom and add two squares for buttons. Then let the kids loose with them! Instant entertainment and because they are just pool noodles, they don’t hurt if the kids get a bit rough with them. Trust me. We had about 12 kids at the party and not one tear during the battle with Darth Vader. I can’t wait to share all the details of the party with you so make sure to stop back later this week! What is your favorite party theme? 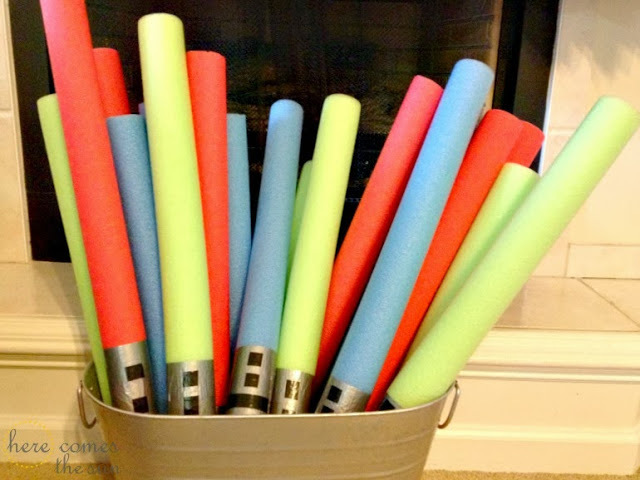 Great Ideas, My son is going to have a Star Wars themed pool party for his next birthday so these would be perfect. Do you think the tape will hold up in the pool? I’m not sure if the tape would hold up in a pool. Maybe you could paint them instead of using tape? I hope your son has a great day. Star Wars is such a fun party theme.